The C715 is a large-diaphragm, multipattern FET condenser with several innovative features. Most visually distinctive is the headbasket, made of foamed aluminum — a product originally developed to prevent jet fuel from sloshing around inside the fuel tanks of fighter planes while in flight. It is strong enough to provide mechanical protection for the capsule assembly without trim rings or internal bracing that could cause standing-wave reflections. Its foam-like cell pattern provides blast protection, much like a foam pop filter. Josephson’s application of this material is patent-pending. The capsule is, unusually, a multipattern single-diaphragm design, similar to the Sony C37 capsule. Whereas most multipattern capsules vary their effective polar pattern by varying the relative levels and polarity of the back-to-back diaphragms, the C-37 design alters its response mechanically, by changing the size of the vent behind the capsule. The presence peak [of the C715 capsule] at the 10-12kHz range is the same height as the peak in the CK12 design [of the C700A and C700S], but it is broader, and it rolls off much more slowly. Instead of having a sharp drop at 18-20kHz, [the C715] rolls off much more evenly, which means it [produces] a much gentler sound, without having the fairly steep phase shift that you would expect at the high end. It’s a different tone color than the CK-12 design. We find people using it for instruments and singers that might sound too harsh otherwise. It’s not something you can correct with EQ. The mic’s low output level is unusual — at 1.2mV/Pa, the C715’s output ranks among the lowest-output condensers we’ve seen. This was a design choice, intended to provide a very high-current output, which gives the mic higher headroom at the expense of output voltage. The power budget for a mic running on phantom power is very limited, so there isn’t much current to drive the load, particularly at high output levels. [Some] preamps load the [mic’s] output rather severely, so we want to have enough output current for the mic to sound good with whatever preamp is used. When we expect that a mic will be used with loud sounds (like the e22S or C715) we use a transformer output stage that reduces the voltage output, but increases the available current. This makes the mic less sensitive to loading, and more able to handle peaks. 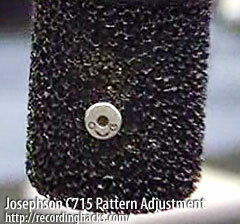 We don’t like to use pads like many mics have, because they can increase distortion or alter the sound balance. The C715 is rated at 140 dB SPL and it will handle this level down to 20 Hz, without a pad. This is unusual for a transformer-output mic. We tried several different [transformer] ratios and settled on the one that produces 1.8 mV/Pa; this is demanding of mic preamps, but results in the best sound. The transformer is a version of a standard Lundahl microphone input transformer, but used in reverse. The internal circuitry uses a class-A cascode FET front end, driving a large nickel core Lundahl output transformer. This mic was a joy to use and excelled in most applications. My least favorite use was as a room mic… [but] up close, this mic brings new meaning to the word “intimate,” revealing detailed nuances on vocals, hand percussion, as a mono overhead for drums and on tenor saxophone. The top end is silky—never sibilant—and hits reverbs perfectly, rendering luxurious articulations.